My name is John Thomas and as Chief of the Department of Public Safety, I look forward to working with you. The University of Southern California trades on its remarkable reputation, offering the highest quality experience to every member of its community. It’s our goal to ensure that safety meets these same standards. As a native of Los Angeles, I know every corner of this city and all it offers us. 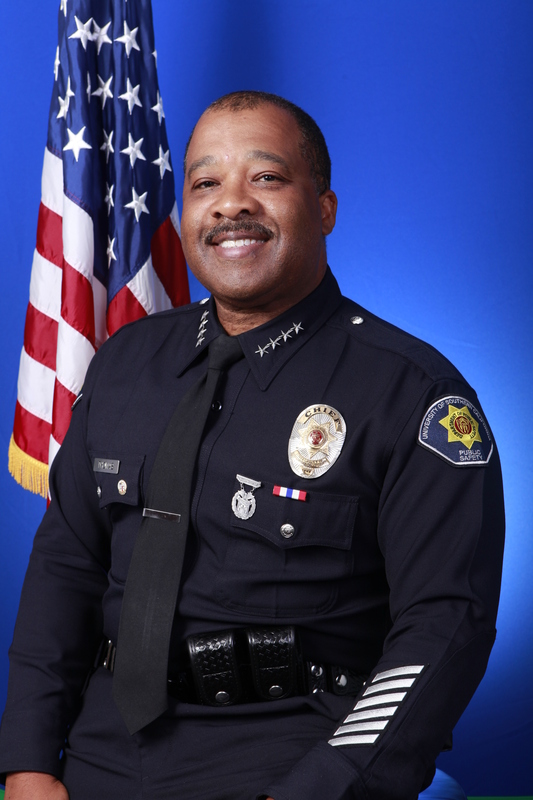 Prior to joining DPS, I spent twenty-one years as a member of the Los Angeles Police Department where I worked on patrol along Wilshire, in South Los Angeles, and as a member of a gang prevention unit, among other roles. First and foremost our campus is a neighborhood of Los Angeles, and we enjoy all the benefits urban living has to offer. The key to staying safe here is the same as it is in every city: stay aware. Our department provides the support you’ll need to experience and discover your urban environment. The men and women of DPS are here to help you achieve the best experience possible. We’re an impeccably trained force that believes in integrity and expertise. We patrol campus and the surrounding community 24 hours a day, 7 days a week. Many of us graduated from the Los Angeles Police Academy, completing the same training as city police officers. We have a direct line of contact to the LAPD and members of the surrounding community. We have officers on foot and in vehicles, blue lights and security cameras throughout campus, and safety shuttles for late night rides home. We’re prepared and we care. We’re here for you whenever you need us, and we want to hear from you. Because we all share the responsibility of keeping campus safe, it’s my goal to keep our system transparent. We want the community to know what we’re doing and why, and we want to know how you think we can improve. I encourage you to call my direct line any time you encounter an issue, or email us your feedback. We read and respond to every message, regardless of whether it’s a complaint or commendation. We’re relying on you to perfect our process and we answer to you, the USC community, first and foremost. Let’s begin a dialogue and make every semester the safest yet. Regardless of where we come from, we’re all Trojans, and it’s that mutual commitment to our university and community that will keep us safe and healthy on campus. By making smarter choices every day, we can build an ideal environment for stellar education. Together, let’s share the responsibility to protect ourselves and our community.